Earn yourself a 50% commission while helping others setup their own online store website! All you have to do is refer visitors to our website through your own unique tracking link, and you'll earn a 50% commission on their purchase. This works out to about $25 to $69 commission per sale depending on which license option the customer purchases. 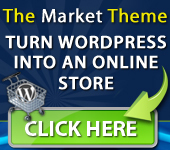 Just showcase the Market Theme on your website or blog, insert your affiliate link, and you can get residual sales for years to come! Our affiliate program is currently managed through "ClickBank.com" (an affiliate program management company). Payments are sent out every two weeks like clockwork. They are extremely reliable, and haven't had a late payment since they started in 1998. Ok, let's get you started earning commissions! First, you'll need to visit Clickbank.com and signup for an account (it's free). This will set you up with your own unique affiliate ID, and let them know where to send your affiliate checks. Once you submit your information, their system will send you a verification email. Make sure you click on the verification link inside to complete your signup. After you get complete the clickbank signup process, you should have your new Clickbank ID. Your Clickbank ID is the same as your username (aka. "nickname"). Simply replace the "XXXXX" portion in the link below with your own Clickbank affiliate ID (nickname). Leave everything else EXACTLY as you see it. This will ensure that you earn a commission every time you make a sale. Add your affiliate link to the marketing resources below or simply use them as a template to create your own promotional content. When you create your own reviews and recommendations that are honest and sincere, people will trust and buy from you. It's a win-win. 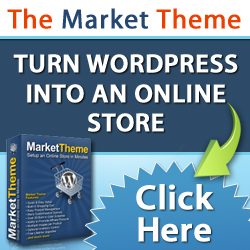 Market Theme is a great product, so it should be pretty easy. Below are some various sources of Email Content, Text Ads, Banner Ads, Product Graphics, PPC ads, and more to help get you started on marketing and generate sales. Below are a few email swipe files you can either use "as-is", or take bits and pieces and rewrite your own content for blogs, webpages, articles, etc. Make sure you replace the "XXXXX" in the affiliate links, with your own Clickbank ID. Setup your own online store in 5 minutes or less! Create a fully functional online store in 5 minutes or less! Supercharge the speed of building an online store! A fully functional online store for the "technical challenged"! Take the "technical" out of setting up an online store! Do you have products you'd like to sell online? Wouldn't it be nice to earn a few hundred (or even a few thousand) extra dollars a month? Are the "technical" parts of setting up an ecommerce website holding you back? * etc. -- The list goes on and on. What if I could tell you, that you could avoid all of those headaches? What if there was an online store template that could help you get a fully functional ecommerce store up and running in 5 minutes or less? There is... and it's called the Market Theme. 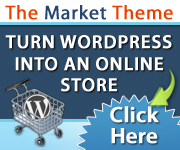 "Market" is an online store theme template with its own built-in shopping cart ecommerce ordering system. It connects easily with your Paypal account (or Authorize.net) for payment processing, and can be ready to go in less than 5 minutes! 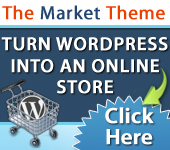 The Market theme works in conjunction with WordPress, a free content management system that has revolutionized the web with its power and simplicity. Rather than struggling through the standard technical requirements of setting up a website, you simply install WordPress, upload the Market theme & activate it, enter a few settings (such as your Paypal ID), choose a color scheme, and that's it. Your online store is setup in minutes, and you're ready to start adding products! The hours, days, or even weeks worth of time you save in setup, can now be spent focusing on activities that will BRING IN money (marketing and traffic building). Furthermore, Market is backed by a risk-free 60-day money back guarantee, so you'll be confident that you have nothing to lose (except for those hours and hours of tedious technical challenges). Supercharge the speed at which you launch your business. 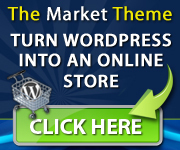 Imagine having your online store up and running in less than a day! 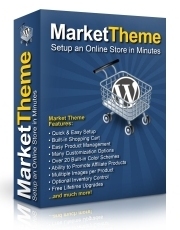 The Market theme takes the "technical" out of setting up a storefront, so you can spend your time on selling products. p.s. If you've even thought about setting up an online store for your business, you won't find an easier solution to use anywhere! So give it a try, risk-free. What if there was an online store template that could help you avoid all of those headaches, and launch a fully functional ecommerce store in 5 minutes or less? Rather than struggling through the standard technical requirements of setting up a website, simply install the Market theme, enter a few settings (such as your Paypal ID), choose a color scheme, and that's it. Your online store is setup in minutes, and you're ready to start adding products! p.s. Market is backed by a risk-free 60-day money back guarantee, so you'll be confident that you have nothing to lose (except for those hours and hours of tedious technical challenges). Supercharge the speed at which you build your website empire! As any experienced online marketer can tell you, setting up the website is one of the most time consuming parts of starting any new web business venture. Wordpress is great because it's easy, and has thousands of plugins and developers available, but what if you want more than just a content site? The expense and time involved in this process can be enormous! There are so many technical requirements just to get your online store ready to start adding products. Market Theme is the solution. 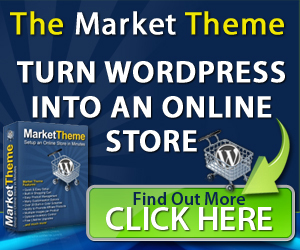 "Market" is an online store theme template for WordPress with its own built-in shopping cart ecommerce ordering system that connects easily with Paypal for payment processing. (Authorize.net and customer ordering w/out payment options are available too.) 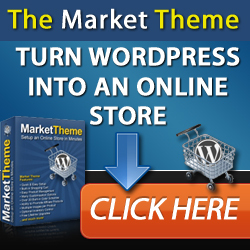 Although Market works like a plugin, it's a fully self-contained WordPress theme. Simply upload the theme, activate it, enter a few settings, choose a color scheme, and that's it. Your online store is setup, and you're ready to start adding products. No additional plugins or integration is required. 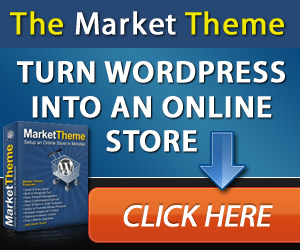 Basically, the Market theme takes the "technical" out of setting up a website storefront. The hours, days, or even weeks worth of time you save in setup, can now be spent focusing on activities that actually BRING IN money (like marketing and traffic building). Imagine having your new ecommerce website setup and ready to go in less than 5 minutes! 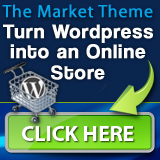 Backed by a full 60-day money back guarantee, trying out Market Theme for yourself is risk-free. If it can save you days worth of work and hours of tedious technical challenges, isn't it worth a test run? So stop getting bogged down by the technical stuff. Supercharge the speed at which you build your website empire! "Market" helps you get things set up quickly, so you can move onto your next project. Reduce time on the technical stuff, so you can spend more time on the marketing! As experienced online marketers can tell you, setting up the website is one of the most time consuming parts of starting any new web business venture. Wordpress is great because it's easy, but what if you want more than just a content site? Why spend any more time on technical items like these? The list of technical items needed just to setup an online store is crazy, and the expense and time involved can be enormous! But not anymore, because Market Theme solves all of this. 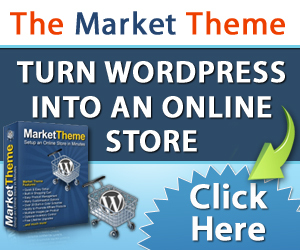 "Market" is an online store theme template for WordPress that contains its own built-in shopping cart ecommerce ordering system. It connects easily with Paypal or Authorize.net for payment processing, and can be ready to go in less than 5 minutes! 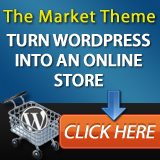 Market works like a plugin, but is a fully self-contained WordPress theme. Just upload the theme, activate it, enter a few settings, choose a color scheme, and that's it. Your online store is setup and ready to start adding products! The hours, days, or even weeks worth of time saved in setup, can now be spent focusing on activities that actually BRING IN money (marketing and traffic building). Backed by a risk-free 60-day money back guarantee, you're guaranteed to save days worth of work and hours of tedious technical challenges. Market will turbocharge the speed at which you build your website portfolio. It takes the "technical" out of setting up a storefront, so you can move onto your next project much quicker. Turbocharge the speed at which you build your website empire! As experienced online marketers know, setting up a website is an incredibly time consuming part of starting a new web business. Besides being a technical headache, the expense and time involved can be enormous! Wordpress is an easy way to setup a website, but what if you want more than just a content site? 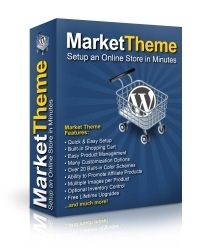 "Market" is an online store theme template for WordPress that lets you setup a website to sell products quickly and easily. It contains its own built-in shopping cart system, that connects easily to Paypal (or Authorize.net) for payment processing. 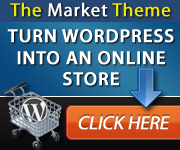 It works like a plugin, but is actually a fully self-contained WordPress theme. Just upload the theme, activate it, enter a few settings, choose a color scheme, and that's it. Your online store is setup and ready to start adding products in less than 5 minutes! The hours, days, or weeks worth of time you save in setup, can now be spent focusing on activities that actually BRING IN money (marketing and traffic building). Turbocharge the speed at which you build your website portfolio. Market takes the "technical" out of setting up a storefront, so you can move onto your next project much quicker. p.s. And because Market is backed by a full 60-day money back guarantee, you've got nothing to lose (except for the days worth of work and tedious technical challenges). 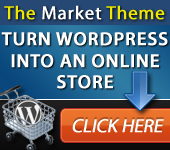 Turn WordPress into an Online Store! Setup an Online Store in 5 Minutes or Less! PPC can be a good method for getting quality traffic in very short time. Here are some example PPC ads you might want to use. Online Store in a few easy clicks! in 5 Minutes or Less! Easy to use. 5 minutes this new WordPress Theme! [Your Affiliate URL Here] Setup an Online Store! for Fast setup, and easy operation. an Online Store in under 5 minutes! Here is a list of keywords that you might find useful in your marketing efforts. 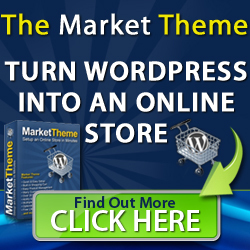 There are literally 1000’s of places you can promote your Market Theme affiliate link. Blog reviews and articles submission sites have been proven to get webmasters loads of free traffics when used correctly. www.squidoo.com -- (PR7) TIP: Google LOVES Squidoo! You may use the following banners and images on your blogs or websites. Just copy and paste the sample code under each banner or image. Where is the "?hop=affiliateID" I sometimes see in the URL? In order to get a higher conversion rate for our affiliates, we have put a redirect in place to remove the "?hop=affiliateID". Be assured that the user's tracking cookies were in fact created. If you want to test this, put your hoplink into address bar, click the "Buy" button, and proceed to Checkout. Scroll down the order page, and your affiliate ID should appear. How Can I Promote My Affiliate Link? We do have some basic guidelines that you should follow as a Market Theme affiliate. First, you may not represent yourself (or your website) to make people think that you are employed by, or part of our company. Your role is as an affiliate only. Second, you must always promote your affiliate link using "White Hat" methods only. This means you may not promote the Market theme in a "spammy" way. Can I Promote Market Theme to an Email List? Yes, however we will absolutely not tolerate any spamming! What constitutes "spam" you ask? Certainly any bulk emailing to a list that is not genuine "opt-in" is not allowed. If you maintain your own list of subscribers, or use a professional list-management service AND each message you send contains a legitimate unsubscribe link, you're probably ok. (You know who you are.) If it's not your own email list, then beware! Make sure that whomever list it is adheres to ethical "white hat" email marketing standards. If you (or whomever does your mailing) violates this policy, your affiliate account will be canceled, and you will forfeit any outstanding payouts. We do not give warnings, so please take it seriously. We want you as an affiliate partner, but will not tolerate any "shady" marketing. If you are unsure about a specific marketing method, please ask us first. We'll be happy to provide clarity. How should I describe what Market Theme is and what it does? Plus, it will make your recommendation more believable anyway. We believe that the absolute best way to promote Market, is to first completely understand how Market Theme works. We highly recommend you play around with Market a little, and get to know the simplicity and the power of it. 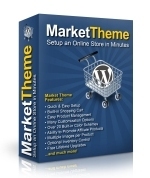 If you don't already own a copy of Market Theme yourself, we recommend you explore and experiment with the online demo. It will make you a much more effective affiliate. We looked at countless themes before we found Market Theme. Most of the others were super complicated. Market Theme was super easy to install and figure out. I think we had a few products added within the first hour. I purchased a license on Friday and had a workable store up in less than an hour. Great job on this theme! Market Theme is amazing, and I can't wait to post my site in the gallery when we launch. I am really excited. Best investment I have made in a long time! I'd like to extend A VERY BIG THANK YOU to the guys at Market Theme - Well done guys for producing a wonderful product!!! Backed by our 100% Money Back Guarantee! Market takes ecommerce to the next level with an easy to use, quick setup platform. Learn more or take the tour. What is the Market Theme? 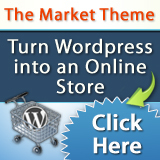 "Market" is the ecommerce theme for Wordpress that takes the technical out of setting up a website storefront. In a matter of minutes you can be setup and selling products from your own online store.